"We're lovers through letters. Some like whips, some like chains. This one likes letters." Apropos to the eve of Valentine's Day in 1989, playwright A.R. Gurney's classic play Love Letters debuted in New York. Starkly staged (two music stands were the sole props) yet emotionally riveting, this deceptively simple two-character story chronicled the lifelong bond of friends Andy Ladd and Melissa Gardner via the reading of their correspondences. Going in, audience members most certainly thought, what a thin premise to keep us glued against our chairs for two hours. But thanks to the dynamite performances of Kathleen Turner and John Rubenstein, living up to the challenge of chronicling the lives of their characters from childhood to their golden years without visual crutches to rely upon, Letters became a Broadway wonder and a worldwide phenomenon. Over the years, Gurney's work has been interpreted by thousands of duos from local theater leagues to big city presentations, with star power combinations (and on occasion, real-life lovebirds) including Robert Wagner and Jill St. John, Dixie Carter andHal Holbrook, and Paul Newman and wife Joanne Woodward. 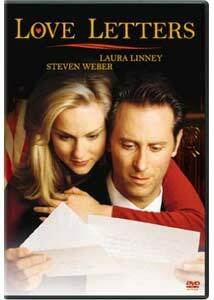 Ten years later, Love Letters took the form of a barely promoted made-for-television movie pairing Laura Linney and Steven Webber. Directed with energetic flair by the legendary Stanley Donen (Singin' in the Rain, Charade), this version opens with Andy seeking solace from the death of a close friend by reaching back to the past and recalling his first contact with Melissa. From the moment he laid eyes upon her in a second grade classroom, it was love at first sight, albeit one-sided. Having to work a little harder to penetrate Melissa's prim exterior, he composes the first of what will be countless notes that will soon expand into numerous categories including party invites, cross-country boarding school correspondence, holiday greetings, congratulatory kudos, sympathy cards, encouraging pick-me-up's and the like between the two. Taken collectively, the letters serve as an ongoing autobiography that chronicles an intense relationship that survives moments of indifference, widely differing career paths, romantic hits and misses, substance abuse, marriages, children, emotional breakdowns and divorce, all culminating in a fateful mid-life reunion that could possibly serve as a flashpoint for Andy and Melissa to finally take their literary bond to the next level. Despite its mid-film plodding problems, a questionable plot deviation that spoils one of the play's most emotionally jolting moments and Webber's slightly detached performance, Love Letters is a mostly satisfying, involving tale of friendship and underlying love constantly threatening to simmer into something more. Adapting a stage production for film is a challenging assignment, but Donen handles the material with stylish grace, jazzing up Andy and Melissa's early years with great period detail and rapid-fire editing representing just how fast time flies with age (particularly during generic correspondences sent almost out of habit rather than feeling). But what really makes Letters worth opening is Laura Linney. Filmed in between her dual triumphs in The Truman Show and the Oscar nominated You Can Count on Me, Linney's enthusiasm for the material and her multi-layered character whose zeal for the finer things in life tempered by rollercoaster emotional states and longing for a man just out of her reach, truly takes your breath away. Image Transfer Review: Given its non-cable network origins from an age when 16x9 formatting for the small screen was still in development, grain and artifacts are noticeable from time to time (particularly during a scene set in Andy's dorm room). As a fair tradeoff, the beautiful cinematography and luminous colors helps make these minor detriments much less bothersome. Audio Transfer Review: Although listed as Dolby Stereo, this talky film could have just as well been advertised as monophonic if not for Lee Holdrige's beautifully scored interludes. But aside from a wide mix during such moments and occasional pieces of up-front ambience, the center channel handles most of the work showcasing the well-recorded dialogue quite pleasingly. Extras Review: An eclectic mix of art house-y trailers, nothing more; a missed opportunity for Columbia not calling in one of Hollywood's most beloved directors for a commentary track. A winning, energetic performance by Oscar nominee Laura Linney and terrific direction from Academy honoree Stanley Donen gives Love Letters a smooth transition from stage to the small screen.